Compete against friends and family in the FIFA World Cup 2018 football predictor and watch each other advance up the leaderboard. This site is free from advertising and there is no joining fee required. 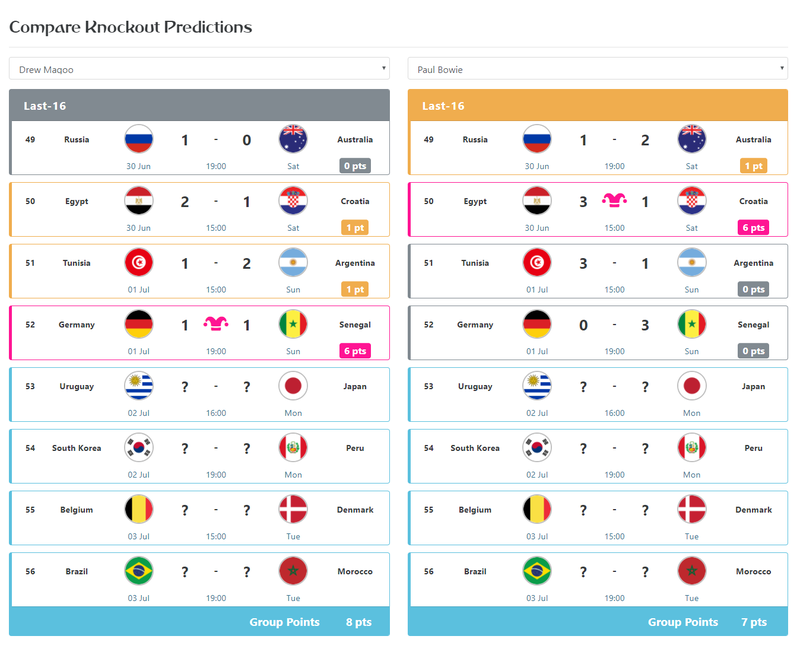 This is a free and fun football predictor designed for your enjoyment. Make use of the joker in each group to make the enjoyment even more fun. Only registered players can join or create a league. Players can be members of multiple leagues. Check out these screen shots to see how the site will look during the tournament. This will be the first World Cup held in Europe since 2006. A total of 64 games will be played to decide the winner. As usual, 32 teams have been drawn into eight groups by 4 teams. The top two teams from each group will qualify for the knockout stage. You will receive 3 points for a correct score. You will receive 1 point for a correct result. Jokers applied to a game will double the points. Jokers can be used once per group. Your prediction for the Knockout stages will include extra time, but not penalties. You will receive extra points for the final game if you correctly predict the tournament winner. Leaderboard: If players finish level on points, then the player with most Correct Score points will finish higher, followed by Correct Result points, Joker points, Final points, Third-Place points, Semi-Final points, Quarter-Final points and then Last-16 points. **New** Joining Fee Tracker. Keep track of who has paid their sweepstake joining fee. Players who have not paid their joining fee, will appear on the league leaderboard with next to their name. Players compete together in a league. Only players who are members of the league will appear on the league leaderboard. 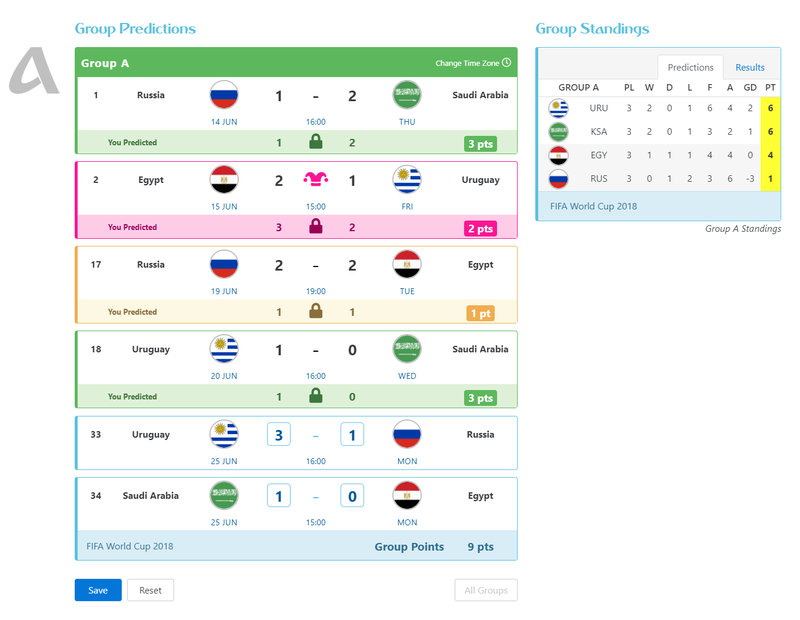 Standings Simulator: watch the group standings update when you input your predictions. If the group standings does not look quite how you think it is going to turn out, go back and tweak your predictions. 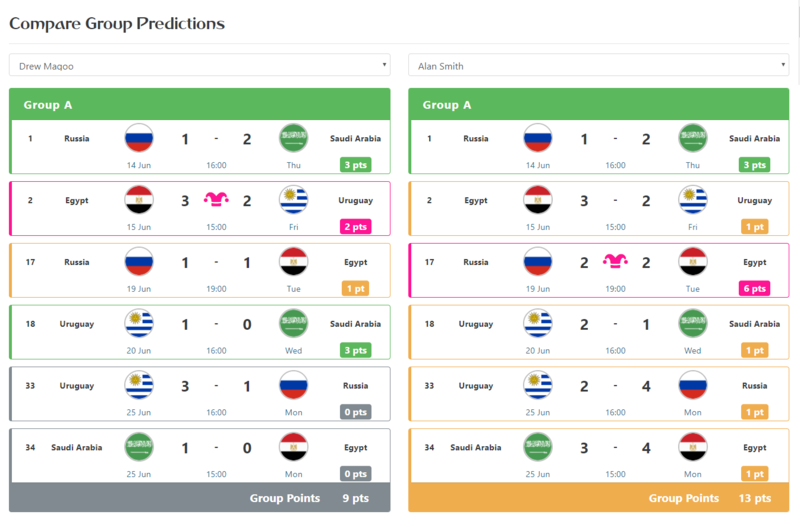 Players can see other players group predictions. Players are prevented from seeing other players knockout predictions until games have kicked off. 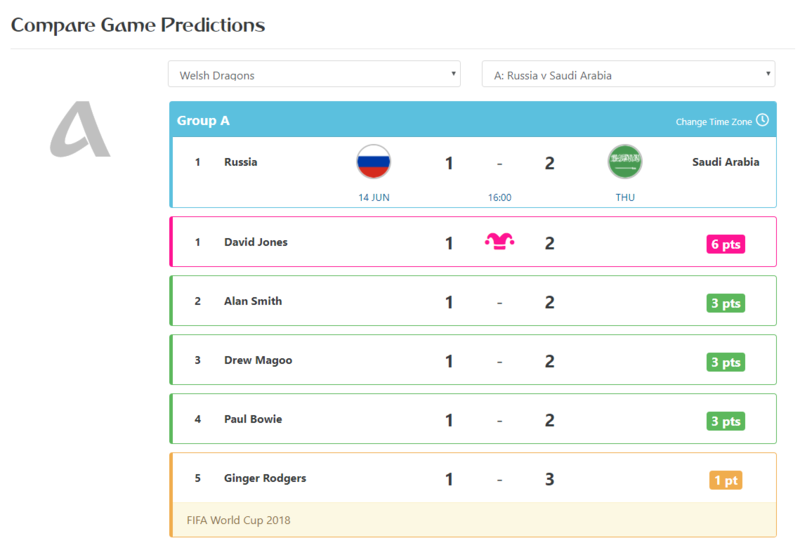 Players may modify their predictions up until each game kicks off. Leagues are created and joined in your profile section. Players can set themselves as private so they will only appear in private leagues. (They will not be seen on the overall leaderboard). Players can update their profile. Players can receive automatic email notifications for forgotten passwords. 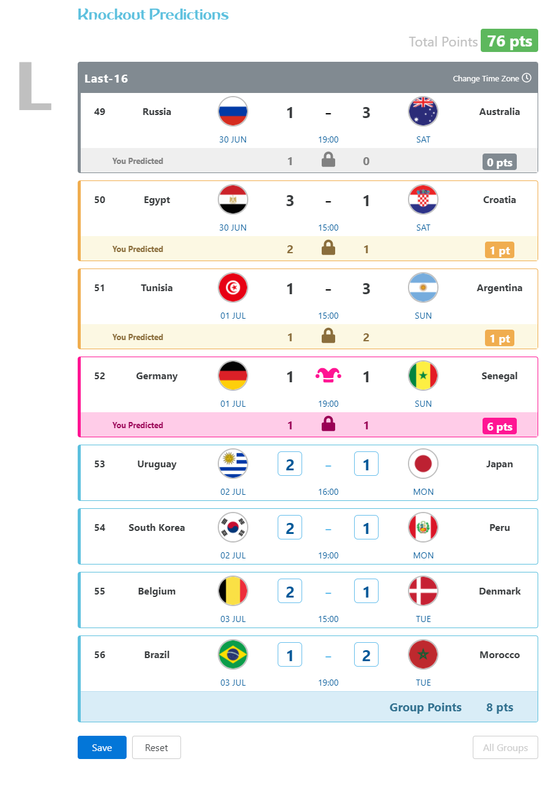 Players can modify their tournament winner prediction up until the last 16 kicks off. The knockout groups are only populated with teams once the group winners are known. Don't think of this website as you would a spreadsheet. You don't just put your predictions in at the start and forget about them. You kept coming back and modifying your predictions depending on who qualified and team form. After all, that is the big advantage of having all your predictions centralised in one place. The league owner can set his league up as a sweepstake. It will be the league owners responsibility to collect the joining fee from the league players. The league owner can remove unwanted players from their league. Sweepstake information is viewed via the league Leaderboard. A sweepstake can only be used in a private league. Leagues can be made private (password protected) to stop unwanted players from joining. Only league members can see their league. Players can be members of multiple leagues. Predictions can be made for weeks in advance. Jokers are only locked once the joker game has kicked off, otherwise jokers can freely be moved. Information on how to set up all these features can be found it the help section. Any questions, my gmail address is in the footer.